Special Containment Procedures: SCP-1398 is to be kept in a secure audio storage unit at Site-19. Playback of SCP-1398-1 must be conducted in a soundproofed test chamber. Personnel administering testing must wear Type-R noise cancelling radio headsets at all times. Test subjects are to be equipped with standard personal microphones to allow communication with test operators and to facilitate transcription of SCP-1398-1 anomalies. Sedatives may be dispensed to subjects at the discretion of test supervisors. Use of test subjects other than Class D personnel requires Level 4 authorization. Testing involving the playback of SCP-1398-1-6 requires the approval of Dr. Espinoza and the presence of at an EMT-P during testing. Further playback of SCP-1398-1-1 is prohibited. 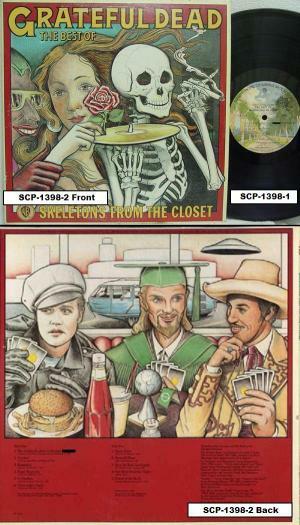 Description: SCP-1398 is a copy of the Grateful Dead album "Skeletons from the Closet: The Best of Grateful Dead" contained on a standard 12-inch LP record; the LP record itself and the album cover are designated SCP-1398-1 and SCP-1398-2, respectively. The audio tracks contained on SCP-1398-1 are designated SCP-1398-1-1 through SCP-1398-1-11. The album was discovered on ██/██/1994 by Agent Bittner while tending to the estate of her late uncle, ██████ ███ Klinge. Questioning of Mr. Klinge's surviving friends revealed that the album was likely purchased new sometime in early 1977 from an unknown record store in █████, ██. 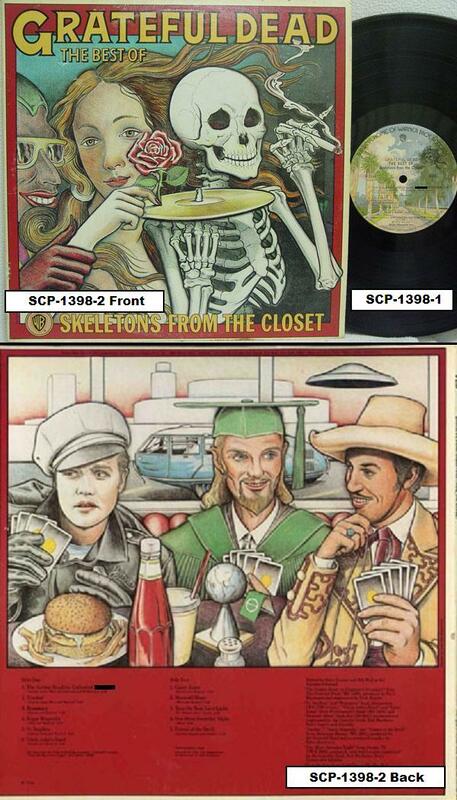 Despite remaining in Mr. Klinge's personal record collection until his death, neither Mr. Klinge nor any other listeners were aware of SCP-1398's anomalous properties. SCP-1398 is physically indistinguishable from other copies of the aforementioned album, with the exception of a slightly modified track list. Whereas typical albums list the first track as "The Golden Road (To Unlimited Devotion)", it is instead listed as "The Golden Road (To Unlimited █████████)" on both SCP-1398-1 and SCP-1398-2. The anomalous properties of SCP-1398 manifest when SCP-1398-1 is played in the presence of individuals capable of perceiving the anomalies. Such listeners report slight uneasiness and hearing substantial deviations from the recordings contained on other copies of the album. Though the musical arrangements of songs remain unchanged, song lyrics are partially or completely altered to encompass tales and subjects markedly different from normal recordings. With the exception of those initially unable to perceive the anomalies, listeners undergoing repeated playback sessions are gradually able to both perceive additional lyrical deviations and increase the regularity with which they hear them. However, this is accompanied by increased anxiety during sessions and sharply decreased willingness to engage in further testing. Chemical sedation of test subjects has proved relatively successful in alleviating this issue. To date, cataloging of lyrical deviations is estimated to be approximately 40% complete. All tracks are at least partially transcribed. See below for an overview of transcription progress. 1 The Golden Road (To Unlimited █████████) see Addendum 1398-01a. 6 Uncle John's Band see Addendum 1398-01b. Addendum 1398-01b: SCP-1398-1-6's overall content is difficult to determine at present. Transcribed portions contain an unspecified narrator discussing one or more unnamed entities. Lyrical anomalies thus far recorded consist of only two stanzas; "He waits with a heavy heart, for his progeny he grieves;/ Each day more return to him, yet even more go deceived/ Long shall be his reign, when he comes again/ Look well for his signs and know, when his blood will flow/", which replaces the fifth stanza, and "Rejoice he is waiting arms held open wide/ Each and all shall sing his blood, those that seek or you who hide/ Approach drink of his love, he won't be denied, he'll come/ Life and breath, flesh and bone, he'll come and take his children home/", which replaces the seventh (final) stanza. What is notable about SCP-1398-1-6 is its additional effect on perceptive test subjects; listeners become markedly more agitated during playback of SCP-1398-1-6, with most immediately requesting cessation of playback. In 27 test subjects this agitation was acute, requiring restraint of subject and, in 16 cases, culminating in syncope. In these acute cases subjects appear to experience hallucinations; reacting to objects/actors that are not present and appearing oblivious to the presence of research personnel. The precise nature of these episodes is difficult to ascertain, as test subjects are invariably uncooperative during playback and unable to recall having any hallucinations or hearing any lyrical anomalies afterwards. Subsequently, those displaying acute reactions to SCP-1398-1-6's anomalies consistently develop progressive cases of thanatophobia post-test. At the outset subjects avoid items or activities which could reasonably cause harm, but increasingly overestimate any possible danger posed to their person. A single affected Class D personnel allowed to continue 160 days past scheduled termination eventually refused to consume any solid food for fear of asphyxiation and reacted hysterically to all requests that he leave his cell. 1. Out of an initial pool of 228 test subjects (composed of 17 Level 1 personnel and 211 Class D personnel) 14 Level 1 personnel and 156 Class D personnel were able to perceive anomalies in only one song at outset of testing. 2. 32 Class D test subjects were able to perceive at least partial anomalies in multiple songs, but not in all songs. 3. 2 Level 1 test subjects and 22 Class D test subjects were able to perceive at least partial lyrical anomalies in all songs. 4. A single Level 1 test subject and 1 Class D test subject were unable to perceive the anomalies associated with SCP-1398-1 playback and instead heard it as an unremarkable album. Coupled with the data garnered at initial recovery, the number of confirmed individuals unable to perceive SCP-1398-1's lyrical anomalies totals at 6.